Take a trip to the wild side with this delicious and nutritious smoothie featuring wild berries and a few other choice ingredients. It’s the time of year in my corner of the world when local fruit is most abundant, cultivated and wild. Blueberries and cherries galore, as well as wild fruits such as black raspberries, mulberries, blackberries, and service berries. My most recent foraging adventure resulted in an epic haul of wild black raspberries and white mulberries. On my way home I knew I’d be using both in a smoothie. In an ongoing effort to procure and consume the most nutrient dense foods possible I have begun incorporating wild foods into my diet. This includes commonly known weeds such as dandelion, lambs quarters, and purslane to sassafras, burdock, and mint as well as wild strawberries, blueberries, raspberries, and mulberries. Why wild foods? They are much more nutrient dense than conventional, even local and organic, produce. Dandelion, for example, contains 7 times more phytonutrients than spinach. Wild berries have much higher antioxidant properties than their cultivated counterparts. Besides being more nutrient dense, wild foods are also lower in calories, taste great, and best of all, free! At the time of writing this I’m a couple chapters into a fabulous new book on the subject: Eating on the Wild Side: The Missing Link to Optimum Health by Jo Robinson. If you’re new to wild foods and foraging I recommend picking up a book on the subject and taking a class or two on plant identification like I have. It’s become one of my favorite pastimes. 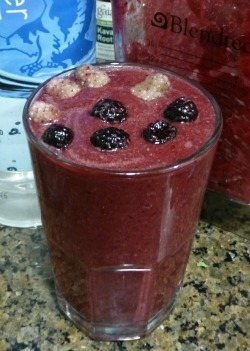 If you don’t have wild berries for this recipe you can substitute conventional berries of your choosing. Word of caution, be very careful with wild black raspberries, they stain everything, which the white shirt I was wearing while picking quickly found out. Enjoy! Place all of these lovely and wild ingredients into your high-speed blender and blend for around 30-45 seconds or until nice and smooth. I’d love to know if you tried this wild berry smoothie or are a wild food forager – please do tell in the comments below. Happy Blending!